In the year 2000 there were only three cases of rabies in the whole of Yunnan, but in the following decade there was an epidemic of the disease and 663 people died. The explosion in rabies cases has mostly affected eastern parts of the province adjacent to Guizhou and Sichuan, and the rabies cases are linked to increasing ownership of dogs in rural areas - and better transport links. In a report published in the journal Emerging Infectious Diseases this week, researchers from the Yunnan Institute of Endemic Diseases Control and Prevention say a mass culling of dogs in the province is urgently needed to curb the ongoing spread of rabies. They say many rural households have dogs that are apparently healthy but harbouring and spreading rabies. Vaccination is not practical for the tens of thousands of poorly supervised dogs in rural towns and villages, and therefore culling is the only realistic option, they say. In their article they says that rabies had been all but eliminated from Yunnan by the late 1990s after serious outbreaks in the 1980s. In the year 2000 there were just 3 cases in one county, but since then the disease has spread to 77 counties within the province and the epidemic shows no sign of abating. The problems has become so bad that Yunnan is now the focal point for the spread of rabies not just within China but also for neighbouring counties such as Laos and Burma, they claim. Rural families often own two to three dogs and there is little legislation to enforce vaccination, they note. 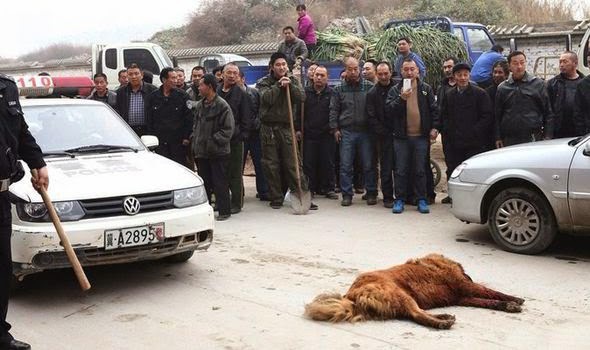 In addition, better road links and increased ownership of vans and cars means that dogs are now traded over a much wider area and they are also sold to restaurants for dog meat. They propose a four point plan for the most severely affected regions of Yunnan, which include Wenshan, Zhaotong, Qujing, and Honghe counties. 1 Domestic dogs should be confined in the household at all times. 2. All unsupervised dogs and domestic dogs within the affected villages to be killed. 3. Vaccination of all dogs in neighboring villages as an emergency and temporary measure. If these measures are not adopted immediately, rabies can be expected to spread to the tourists towns of Lijiang and Dali, they warn. In the longer term, compulsory vaccination programs for all dogs will be needed to curb rabies. However, they are pessimistic about the prospects for such a campaign. "The greatest obstacle to removing the threat of rabies is the low level of political commitment because dogs are not regarded as economically useful animals in Yunnan Province," they conclude.